Context: Chronic granulating burn wounds are covered with split-thickness skin grafts (SSG) after scraping of granulation tissue. But scraping is associated with increased blood and protein loss, and time required for hemostasis. We, therefore, conducted a study to determine if scraping can be avoided. Aims: Comparison of outcome of SSG and blood loss in burn wounds treated with and without scraping of granulation tissue. Settings and Design: Prospective clinical study. Materials and Methods: Over a year, 30 adult patients, with healthy granulating postburn wounds of size at least 100 cm2 and 4 to 10-week duration, were included. Wounds were divided into two halves, with one-half grafted after scraping (Group A) and other without scraping (Group B). Intraoperative blood loss was calculated. Dressings were done at postoperative days 3, 5, 7, and 10. Graft take, complete wound-healing time, and regrafting requirement were assessed. Statistical Analysis: Unpaired t test for quantitative variables. Results: Mean graft take (87.21 ± 9.48 Group A; 86.58 ± 11.18 Group B) was similar in both groups. Average intraoperative blood loss was significantly lesser (Group A 54.58 ± 6.5 mL/100 cm2; Group B 10.2 ± 1.5 mL/100 cm2), and duration of complete wound healing was increased without scraping (14.66 ± 2.79 days Group A; 15.73 ± 3.13 days Group B). There was no requirement of regrafting in both groups. Conclusion: Scraping of wound bed is avoidable in selected patients, although at expense of marginally faster healing. Leaving the healthy granulation tissue intact does not affect overall graft take and is associated with decreased blood loss. Burn injury is a formidable public health problem, and chronic burn wounds especially are a cause of increased morbidity among burn survivors. Early excision with primary or delayed closure is the treatment of choice in deep burns. However, this is not always possible, as in developing countries with lack of adequate burn care facilities in remote areas, it is not uncommon for patients to present with chronic burn wounds for definitive treatment. In such cases, where deep burn wounds have been previously managed conservatively, there is a requirement of skin grafting, which is done after eschar separation leaves the wound bed covered with granulation tissue, usually 3 to 6 weeks postburn. The granulation tissue can be either removed or left intact prior to grafting the burn wound. The preparation of wound bed is done to make it well-vascularized and to remove any exudates. This will provide a favorable medium for graft take and healing of wounds. During debridement, bacterial colonies housed in biofilms and dead, necrotic cells are removed, thus effectively converting chronic wounds into acute wounds. In addition, excessive extracellular matrix and inflammatory enzymes are also eliminated. But debridement of the wound comes with its own pitfalls of increased blood loss, oozing of tissue fluids, need for hemostasis, and added insult to the patient., Application of grafts directly on the granulation tissue or the nonscraping technique has been previously described.,, It not only avoids physiological perturbances associated with debridement but can also save operation theater time and exposure to prolonged anesthesia. We conducted a study at our hospital to compare the primary outcomes of grafting (graft take and time to complete wound healing) and secondarily evaluate the intraoperative blood loss during surgery, and requirement of regrafting in cases of postburn granulating wound undergoing skin grafting, with or without scraping of the granulation tissue. From July 2013 to June 2014, 30 patients of age group 15 to 60 years, presenting late with postburn granulating wounds of at least 100 cm2 and duration of 4 to 10 weeks were included in the study. Patients with wound swab culture positive for β hemolytic streptococcus; comorbid conditions such as diabetes, hypertension, anemia, malnutrition, bleeding diathesis, and on corticosteroid and chemotherapy were excluded from the study. Ethical clearance was obtained from the Institutional Ethical Committee. Written informed consent was taken from all patients. Their demographic data were recorded and compiled. A complete blood count, bleeding and clotting time, wound swab culture, and sensitivity were recorded for each patient preoperatively. In patients with a single wound, half of the wound was scraped and assigned to Group A, and the remaining half with intact granulation tissue was assigned to Group B [Figure 1]. In patients with multiple wounds, those on left side were assigned to Group A with scraping of the granulation tissue and those on the right were included in Group B [[Figure 2]a and [Figure 2]b]. In both the groups, a SSG was applied to cover the wounds. 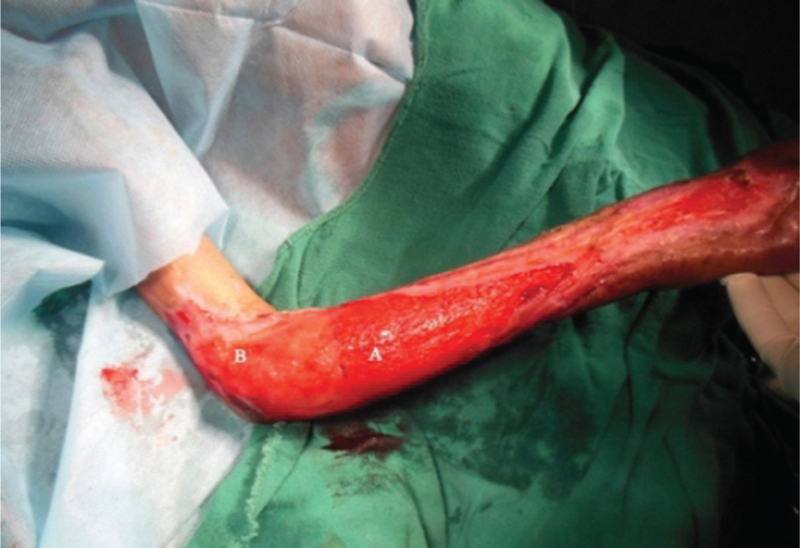 Figure 1: Division of post burn granulating wound on right upper limb into two halves. Inclusion of distal half in Group A, with scraping of granulation tissue and proximal half in Group B, leaving the granulation tissue intact. Figure 2: (a) Post burn wound on the right foot of a patient after scraping of the granulation tissue (Group A). (b) Post burn wound on the left foot of a patient with the granulation tissue left intact (Group B). All patients were operated under general anesthesia. Wounds were cleaned with 5% iodine formulation followed by saline wash. A sterile lint piece was cut into shape of the wound, placed over a graph paper, and its borders outlined with ink [Figure 3]. 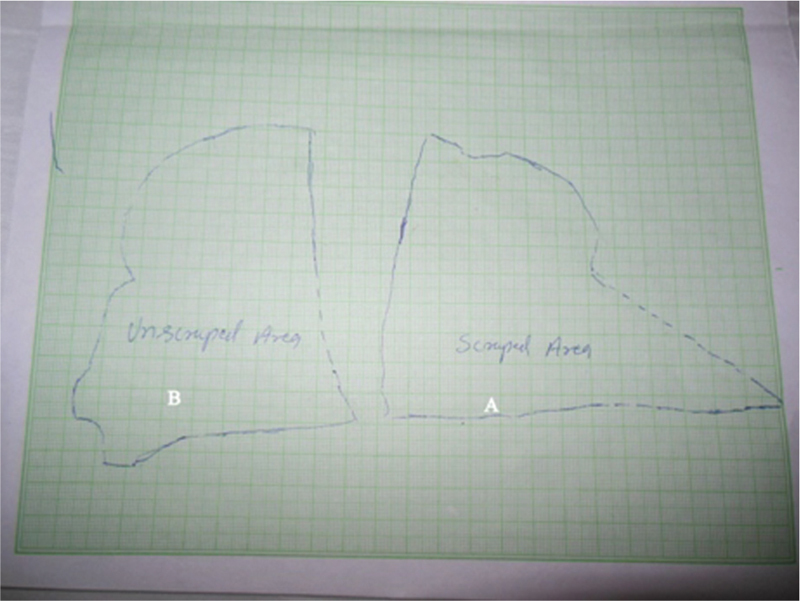 The wound area was then calculated by counting the large and small squares of graph paper inside the outlined area [Figure 4]. The study was done by dividing the wound area into two equal halves, each of which was designated to either group. Complete scraping of granulation tissue was done with the handle of a number 4 surgical scalpel in wounds belonging to Group A. The granulation tissue was left intact in wounds of Group B. Figure 3: Lint piece cut to the shape of the wound, for measuring the area of the individual halves. Figure 4: Outline of the lint piece and measurement of wound area of each half of the wound by counting the squares on the graph paper. 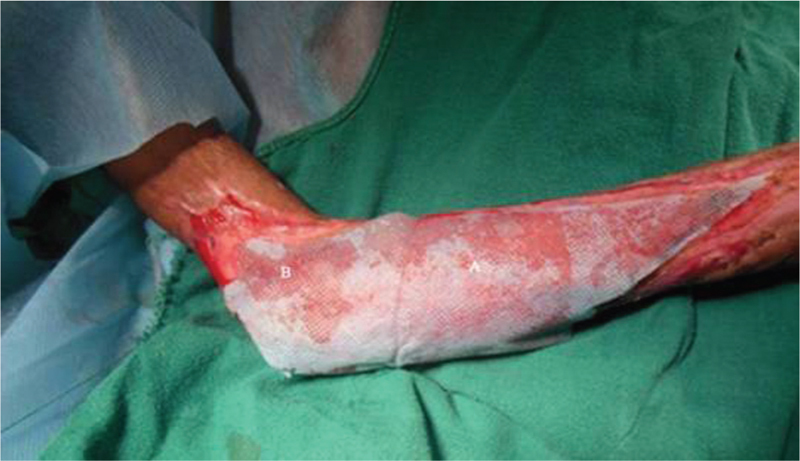 Hemostasis was achieved by application of compression bandage over adrenalin-soaked gauze pieces for a period of 8 to 10 min. This time was utilized to harvest a split-thickness skin graft from the donor site. The wound bed was then reinspected, and electrocautery or ligation were utilized to secure any remnant bleeding. Intraoperative blood loss was determined as the weight difference of the wet gauzes used in cleaning and achieving active hemostasis pre- and postoperatively. Utmost care was taken to avoid soiling of blood-soaked pads with granulation tissue. Preoperative weight of gauzes used in this procedure was determined by weight difference between total wet gauzes taken preoperatively and remaining wet gauzes postoperatively in a bowl. All these weight measurements were done on same standard weighing machine. In both groups, similarly meshed SSG were applied to the recipient site and secured by staples or sutures, and splint was given to provide immobilization. Graft take was monitored on postoperative days 3 [[Figure 5]a], 5, 7 [[Figure 5]b], and 10 [[Figure 5]c]. Dressings were done thereafter as required. Percentage of graft take was measured on 10th postoperative day by using the graph paper method, as described above, and calculated by subtracting the area of graft loss from estimated preoperative raw area in both groups. Final outcome was decided by graft take as observed on tenth day. Time required for patient to be free from dressing and complete wound healing was calculated in both groups. Requirement of regrafting was also noted in both groups. Figure 5: (a) Graft take as seen on third post-operative day. (b) Graft take as seen on seventh post-operative day. (c) Graft take as seen on tenth post-operative day. Categorical variables were presented in number and percentage (%), and continuous variables were presented as mean ± standard deviation and median. Normality of data was tested by Kolmogorov–Smirnov test. Quantitative variables were compared using unpaired t test between the two groups. Qualitative variables were compared using Chi-square test. A P value of less than 0.05 was considered statistically significant. The data were entered in MS Excel spreadsheet and analysis was done using Statistical Package for Social Sciences (SPSS) version 21.0, SPSS Inc., Chicago, IL, USA. There were 19 (63.33%) males and 11 (36.66%) females included in the study and the mean age of patients was 27.3 years. Twelve patients had a single postburn raw area, which was divided in two parts (Groups A and B), and 18 patients had multiple raw areas over different parts of body, in whom one raw area on each side was designated to either group. Mean area grafted was comparable in both the groups (161.67 ± 53.92 cm2 in Group A and 163.48 ± 49.48 cm2 in Group B, P value 0.73). Comparative distribution of wound area grafted is shown in [Table 1]. Although the graft take was comparable in both the groups, there was significantly decreased blood loss and increased duration of complete wound healing in Group B as compared to Group A [Table 2]. There was no requirement of regrafting in both the groups. Skin grafting in acute and chronic burn wounds has been studied extensively in an effort to identify variables that influence graft take and wound healing.,,, In our study, we objectively evaluated the effects of scraping of granulation tissue on skin grafting and compared it with those in which graft was applied directly without scraping. Eschar separation in full thickness burns results in wounds covered by granulation tissue, which contains a network of blood vessels, extracellular connective tissue, and inflammatory cells. It has an excellent blood supply but also contains debris and bacteria in the form of biofilm on its surface. Healthy granulation tissue fit for surgery skin grafting is characterized by pink to red in color, finely granular appearance, moist, epithelialized margins, minimal discharge, does not bleed easily on touch, and free from β-hemolytic streptococci organisms. Granulating burn wounds are usually managed by application of SSG, which provides coverage and minimizes scarring, contracture, and its sequelae. Although most surgeons scrape the granulation tissue before grafting, some others consider it unnecessary. Brown et al. in their study on thick split-thickness grafts, did not remove the granulation tissue if it was nonedematous and healthy. However, if the granulations were long standing and fibrous, they were removed before applying the graft. No significant difference was shown in the microbiological profile, take of graft, and esthetic appearance of the grafts between scraping and no scraping, in a study carried out by Dhar et al. The mean graft uptake percentage in their study with removal of granulation tissue was 83.74 ± 16.74%, and without granulation removal was 84.23 ± 18.90% showing no statistically significant difference. Our study also did not reveal any significant difference in the graft take between the two groups. Nonremoval of the granulation tissue did not have an adverse effect on the graft take, and this can be attributed to the rich vascular network that is contained within it. Also the reduced oozing from wound bed when the granulation tissue is left intact conserves the proteins that are required for building body reserves in such patients. This could also help in graft take as nutritional status has been found to be an important factor in graft healing. Time taken for complete wound healing is an important factor affecting patient satisfaction as it determines the period for which the patient will be encumbered with dressings. There is limited literature defining the actual length of time it takes for the burn wound to heal completely following skin grafting., A study conducted to identify the factors that affect the time to complete wound healing, found that most burn wounds, after primary excision and skin grafting, healed within 2 weeks, and the time to complete wound healing was not influenced by age, gender, total body surface area burned, presence of infection, or graft type. It also concluded that if detailed attention is given to avert complications like formation of hematoma or seroma, it might decrease the time taken for wounds to heal completely. In our analysis of grafting of chronic burn wounds, we found that the mean duration of complete wound healing was significantly delayed in wounds in which the granulation tissue was not scraped. This can be attributed to the fact that there are numerous other elements that can delay wound healing like shear, which were not taken into consideration in our study. Also, presence of hypergranulation in the nonscraping group could have led to the increased time for healing as reported by Jewell et al. Quantification of blood loss with two methods, gravimetric and colorimetric, has been compared previously, and the gravimetric method has been proven to be a simple, objective, and accurate technique of calculating intraoperative blood loss. In our study, we estimated the intraoperative blood loss using the gravimetric method. Studies evaluating blood loss during primary excision of wounds and skin grafting have shown significant amount of losses ranging from 5.9 to 9.2% of the patient’s estimated total blood volume for each percentage area of burn excised., However, there are insufficient data quantifying blood loss in patients undergoing grafting of chronic burn wounds with debridement of the granulation tissue. We found an average blood loss of 54.58 mL/100 cm2 of granulation tissue debrided in the scraping group, which was significantly more than in the nonscraping group. Although Dhar et al. did not exactly quantify the blood loss, they did report more blood loss with excision of granulation tissue as compared to nonexcision, when grafting chronic burn wounds. Significant blood loss results from surgical removal of granulation tissue, which is a significant burden on the suboptimal health condition of the burn patient. More secure hemostasis and lesser oozing of tissue fluids were also noticed in the nonscraping group. Morbidities due to extensive debridement cannot be ignored if massive areas of burn wound are degranulated. If inappropriately managed, it can lead to severe blood loss, loss of tissue fluids, dyselectrolytemias, and hypothermia. This study was, however, underpowered to assess the same as the study population had only 13 sites (21.66%) with surface area more than 200 cm2. Moreover, as chronic granulation tissue contains fibroblasts, chronic inflammatory cells, and bacteria, debridement can reduce scar formation in the long run. Evaluation of long-term outcomes and scar quality was, however, not a part of our study protocol. Further validation studies evaluating immediate and long-term outcome in patients with large surface areas of burn are thus recommended. Our study showed that grafting a nonscraped bed, does not affect the overall graft take and is associated with lesser intraoperative blood loss, decreased oozing of tissue fluids, and reduced need for time-intensive hemostasis as compared to when wounds are scraped. This reduction in the perioperative risk to the patient outweighs the advantage of marginally faster healing seen in wounds that were scraped. We, therefore, conclude that scraping of wound bed is avoidable in selected cases when burn wounds with healthy granulation tissue are grafted. Pham TN, Gibran NS, Heimbach DM. Evaluation of the burn wound. management decisions. In: Herndon D, editor. Total Burn Care. 3rd ed. London: Saunders, Elsevier; 2007. p. 119-26. Muller M, Gahankari D, Herndon DN. Operative wound management. In: Herndon DN, editor. Total Burn Care. 3rd ed. Philadelphia: Saunders, Elsevier; 2007. p. 117. Panuncialman J, Falanga V. The science of wound bed preparation. Clin Plast Surg 2007;34:621-32. Luo G, Fan H, Sun W, Peng Y, Chen L, Tao J et al. Blood loss during extensive escharectomy and auto-microskin grafting in adult male major burn patients. Burns 2011;37:790-3. Dhar S, Saraf R, Gupta AK, Raina B. Comparative study of skin grafting with and without surgical removal of granulation tissue in chronic burn wounds. Burns 2007;33:872-8. McGregor Alan D. Free skin Grafts, chapter 3. In: McGregor Alan D, editor. Fundamental Techniques of Plastic Surgery. 10th ed. Philadelphia: Churchill Livingstone, Harcourt Publishers Ltd.; 2000. p. 35-59. Rudolph R, Ballantyne DL. Skin grafts. In: McCarthy Joseph G, editor. Plastic Surgery. Vol. 1. Philadelphia: WB Saunders Company; 1990. p. 221-74. Stone HH, Fabian TC, Turkleson ML, Jurkiewicz MJ. Management of acute full-thickness losses of the abdominal wall. Ann Surg 1981;193:612-8. Agarwal P, Prajapati B, Sharma D. Evaluation of skin graft take following post-burn raw area in normovolaemic anaemia. Indian J Plast Surg 2009;42:195-8. Mohammadi AA, Seyed Jafari SM, Kiasat M, Pakyari MR, Ahrari I. Efficacy of debridement and wound cleansing with 2% hydrogen peroxide on graft take in the chronic-colonized burn wounds; a randomized controlled clinical trial. Burns 2013;39:1131-6. Petkar KS, Dhanraj P, Kingsly PM, Sreekar H, Lakshmanarao A, Lamba S et al. A prospective randomized controlled trial comparing negative pressure dressing and conventional dressing methods on split-thickness skin grafts in burned patients. Burns 2011;37:925-9. Grey JE, Enoch S, Harding KG. Wound assessment. BMJ 2006;332:285-8. Brown JB, McDowell F. Massive repair of burns with thick split skin grafts. Ann Surg. 1942;115:658-74. Moghazy AM, Adly OA, Abbas AH, Moati TA, Ali OS, Mohamed BA. Assessment of the relation between prealbumin serum level and healing of skin-grafted burn wounds. Burns 2010;36:495-500. Vehmeyer-Heeman M, Van den Kerckhove E, Gorissen K, Boeckx W. Povidone iodine ointment: No effect of split skin graft healing time. Burns 2005;31:489-94. Jewell L, Guerrero R, Quesada AR, Chan LS, Garner WL. Rate of healing in skin-grafted burn wounds. Plast Reconstr Surg 2007;120:451-6. Lee MH, Ingvertsen BT, Kirpensteijn J, Jensen AL, Kristensen AT. Quantification of surgical blood loss. Vet Surg 2006;35:388-93. Budny PG, Regan PJ, Roberts AH. The estimation of blood loss during burns surgery. Burns 1993;19:134-7. Steadman PB, Pegg SP. A quantitative assessment of blood loss in burn wound excision and grafting. Burns 1992;18:490-1.